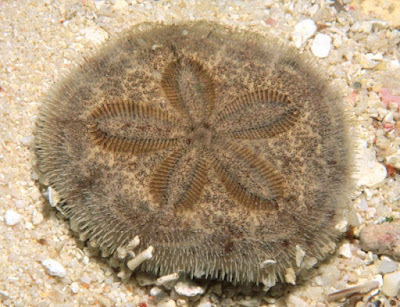 Clypeaster is a higly diverse genus of sand dollars, with over 400 named taxa in the literature, known from the Upper Eocene to the present (Durham 1966). Characters (from Durham 1966): Medium-sized to large, test flattened to highly campanulate, margin rounded to flattened and inflated; peristome usually in deep infundibulum; oral surface flat to concave; petals variable, closed and rounded to open or sublyrate, with outer pores elongate, inner ones rounded, commonly connected by groove; periproct usually inframarginal, rarely marginal, situated between third and fourth, or fourth and fifth, pair of coronal plates; buccal membrane naked, with imbedded irregular spicules; internal supports variable in abundance, consisting of thin laminae and pillars; wall of test sometimes double, separated by pillars. [D66] Durham, J. D. 1966. Clypeasteroids. In: Moore, R. C. (ed.) Treatise on Invertebrate Paleontology pt U. Echinodermata 3 vol. 2 pp. U450–U491. The Geological Society of America, Inc., and The University of Kansas Press. [MD66] Melville, R. V., & J. W. Durham. 1966. Echinoids—skeletal morphology. In: Moore, R. C. (ed.) Treatise on Invertebrate Paleontology pt U. Echinodermata 3 vol. 1 pp. U220–U251. The Geological Society of America, Inc., and The University of Kansas Press. [M89] Mooi, R. 1989. Living and fossil genera of the Clypeasteroida (Echinoidea: Echinodermata): an illustrated key and annotated checklist. Smithsonian Contributions to Zoology 488: 1–51. [O75] Owen, R. 1875. On fossil evidences of a sirenian mammal (Eotherium aegyptiacum, Owen) from the nummulitic Eocene of the Mokattam cliffs, near Cairo. Quarterly Journal of the Geological Society of London 31: 100–105.